Location is the closest accommodation to the beach in the Margaret River wine region. Your accommodation is in a great beach location in Dunsborough, including free WiFi and streaming to Netflix, Foxtel Now and more. Most of all, your Dunsborough accommodation includes an architecturally designed, luxury beach house, the closest location to the beach in the entire Margaret River wine region. And the beach is located just steps from your door, sheltered from the sea breezes found in other locations. Entry is through Whalers Cove at 3 Lecaille Court Dunsborough. Head around the curve to the beach house at the end on the left with the turret. Also, there’s undercover parking for two cars and space for two more cars. 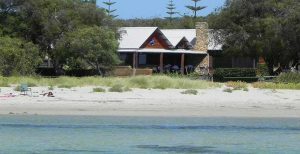 Beach House Dunsborough is luxury beachfront accommodation located in the Margaret River wine region of Western Australia. We give you the best beachfront holiday possible in a beautiful location. You deserve the best for your holiday, and there’s nothing better than sitting on the balcony looking across the sheltered beach, with a quality Margaret River wine in your hand in your beachfront location. The blue water and white sand bars to walk on are stunning. Furthermore, the beach is sheltered for children, with a big grass area to play on while you watch from the veranda. Beach House Dunsborough is surrounded by award winning wineries and some of the world’s best beaches, including Meelup beach located just 5 minutes away, and Bunker Bay is also located nearby. And your luxury accommodation is just a 5 minute walk from your Beach House location to Dunsborough’s pretty cafes and shops. You certainly don’t need to drive anywhere. It’s easy walking on the beach path to Dunsborough town located to the right, or to Old Dunsborough beach located to the left. Above all, we will beat any booking site price by contacting us direct at Beach House Dunsborough. Email us from this website or phone Erin on 0402 882244.